As we continue to take a look back over the past year to see how far we’ve come and what 2012 brought us, we now turn our attention to those hot summer months. Tempers flared, stocks dived and scandals heated up. As we headed into the second half of the year, the numbers for the first half of 2012 painted a tough picture on a number of fronts. One of those stories that garnered a lot of attention was the more than one million foreclosures, default notices, auction announcements and bank repos. The spring was especially brutal as a sharp increase in foreclosures resulted during April, May and June. The numbers rose to 9%. That was 2% higher for the second quarter than the first quarter of 2012. Further complicating matters was the 24 dozen states that saw double-digit increases. For some states, including Indiana, Pennsylvania, South Carolina, Connecticut, Florida and Illinois, the increases were as much as 20% or more. You may recall the mortgage settlement that a federal judge signed off on in April that resulted in banks moving forward with all those foreclsoures they’d been withholding until the legalities were worked out. That accounted for many, but not all. We know these deceptive marketing tactics for credit card add-on products are not unique…and all financial institutions are on notice about these prohibited practices and reinforces that they must make sure their service providers are complying with the law. The bureau also announced it would be focusing a lot more attention to student loans and mortgages in the second half of the year and into the new year. In late August, Fed Chairman Ben Bernanke told a group of educators that kids today are guaranteed a better financial horizon that their parents have today. He said the key is in financial education while the little ones are still young. In fact, he has strongly recommended and encouraged any efforts of a financial literacy course even in elementary school. My best guess is that our kids will be better off than we are. Bernanke cited technological advances over the past two decades as one reason for the brighter outlook, even if today’s environment is anything but bright. Also in late August, J.D. Power and Associates released its annual review of more than 13,000 opinions on credit cards and for the sixth year in a row, American Express ranks at number one in consumer satisfaction. A report compiled by the Pew Center told the tale on payday loans. With more than 12 million Americans who take out a whopping $7.4 billion in payday loans each year, and with those borrowers hitting at least 8 times the funds from loans such as those, it was clear the time for change had arrived. Around 5.5% of adults in the U.S. have used a payday lending company at some point over the past five years and a startling 75% of those borrowers looked to their community “brick and mortar” company instead of turning to online loan products. Before they were able to escape these products, they often will have paid more than $500 in interest. The debt collection practices of banks and credit card companies was placed under a stark light in September. It was discovered that up to 90% of all lawsuits filed by credit card companies are flawed. The card companies cannot prove the balances are owed, which had the potential to wipe out debt owed by consumers who were hauled to court. American Express and Discover were least likely to file faulting lawsuits. Right before the presidential election this year, the number of Americans who filed for first time unemployment benefits crept up by 4,000 to a seasonally adjusted 372,000. The Obama Administration was concerned, though in hindsight, it obviously had nothing to worry about. Moody’s wasted no time in early September getting to the core of its concerns. It announced it planned on downgrading the U.S. credit rating if Congress and the president did not find a solution to reduce GDP. In a statement released September 10, the ratings company said the outcome of budget negotiations during the 2013 Congressional legislative session would determine how the government’s AAA rating would look if the session didn’t impress. It made it clear that if it had to decide right then, it would most certainly downgrade. The statement came as part of the release of the “Update of the Outlook for the US Government Debt Rating.” IMoody’s wanted to ensure negotiations would result in new and very specific policies that stabilize the economy as well as proof that a downward trend in the ratio between the federal debt and GDP is imminent. Powerful though it was, not everyone took the threats seriously. One reason was the fiscal cliff that hardly anyone was talking about in September. No one thought Congress would let it go this far. In fact, most everyone believed first, that the solution would be found prior to the election. After all, why would Obama leave it undone knowing it could have affected his votes? Of course, as we know today, not only was it not worked out ahead of time, but they have yet to find a solution as we near the end of the year. There are mere days left for them to figure it out. Other reasons cited for the non-plussed attitude was the massive spike in food stamp applicants, the latest jobs numbers, the lack of consumer confidence and a host of other factors. Finally, another report was released that showed fraud was on the rise that targeted seniors in the U.S. The Federal Trade Commission released the report that was comprised of consumer complaints. What it revealed was disturbing. The overall volume of complaints in 2011 associated with fraud against the elderly jumped by more than 24% from numbers in 2010. It affected more than 1.8 million elderly last year. Identity theft topped the list of complaints for the second straight year, and accounts for approximately 15% of all complaints with one quarter of identity theft complaints involving alleged tax or wage fraud. We’re getting close to wrapping up those stories for the rest of 2012. 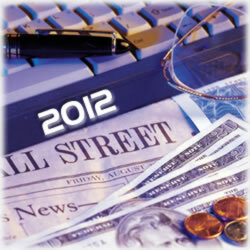 What was the most news-worthy story from the financial sector that you saw this year? Check back with us – it just might make our list.